Copy Of Martina Hamilton Address for #NWED Sligo 2018. Thank you to Oonagh Monahan and the Sligo Women In Business Network for honouring me as your ambassador for National Women’s Enterprise Day. I would also like to thank Liam Kiely of the Local Enterprise Office for their continued support of SWIBN. If I may, I would like to start by reading you a poem. This was written by the late Leland Bardwell who lived here in Co. Sligo, near my home in Maugherow for perhaps the last 30 years of her life. Aside from Leland’s poetry being beautiful and insightful enough for any occasion I have a reason for reading this poem, a little bit of “Local to Global news” to bring to you today concerning this poem. While working to establish Sligo’s annual Yeats Birthday celebration on June 13th each year, with Susan O’Keeffe, I developed the Hamilton Gallery annual Invited Artists exhibition, themed around a seminal poem by Yeats. 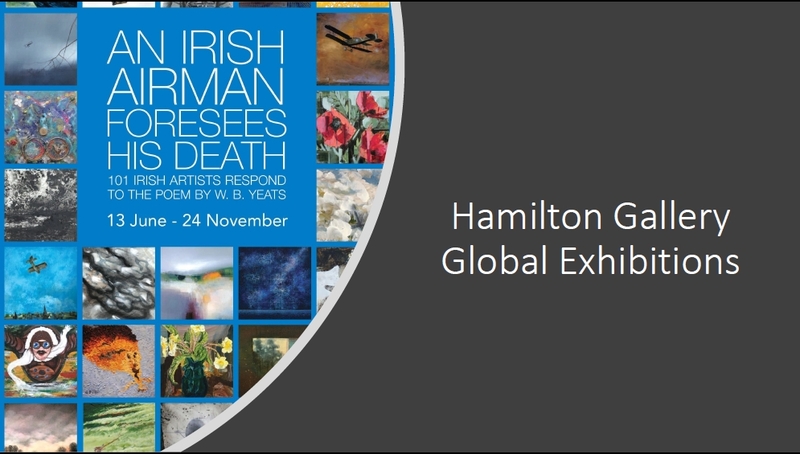 This event has grown in stature and this year over 100 Irish visual artists contributed to the current show “An Irish Airman foresees his death”. The exhibition will run until Armistice Day which takes place on Sunday 11th November. Ann Derwin, Director General - Global Irish Services Division of the Department of Foreign Affairs picked up on the format and has now asked us to curate a new take on the exhibition which will take place in January in London. This exhibition, fittingly enough for the day that’s in it today, will be in celebration of Leland Bardwell, with the poem I read at the start being used as the theme for the show. The artists contributing will all be women and at present over 90 artists have responded to our invitation. I can’t tell you how pleased I am, that Leland, who lived amongst us here in Sligo for such a significant portion of her life, will be at the focal point of this initiative. Images from Leland Bardwell’s auto biography “A Restless Life, at an exhibition opening in the Yeats building and with her friend and neighbour, writer Brian Leyden. I think for the theme of today’s speech I had to include these two events as they certainly have moved from Local to Global. Over the last two months putting the possibility of the London exhibition together, taking soundings, emailing the poem out to artists, briefing them on the theme, it was only in the last couple of weeks I began to re-read Leland’s poem properly. To weigh it in my mind the way poetry deserves to be weighed. The first thing I noticed was a synchronicity with my own life, one that surprised me simply because I hadn’t noticed it at first. The poem is titled St Brigid’s Day 1989. And 1989 was the year I got married, put down roots and set up my workshop in Sligo. Synchronicity like this are important to me, I always take happy accidents like this on board, I feel they are nudges in the right direction as I’ll explain further on. But the fact I hadn’t noticed this one gave me pause for thought. I wish now that I had had the chance, metaphorically, to gather reeds with Leland. My hope is we might have found some common ground in the smallest of things, the smallest of observations, and I feel I certainly would have learned a lot from her. The devil would be in the detail, that in the details of where I belong and what inspires me, I just might have shared a parallel direction with her, in moving from local to global. I do hope the exhibition in London and the cultural attention and appreciation it may focus on Leland as such an influential Irish writer will be something she would have enjoyed. I had always found walks along the Streedagh beach, on Conor’s Island towards Dernish and Mullaghmore a source of constant inspiration. Long walks here I suppose have become my way of harvesting reeds, of creating something out of where I belong. There is the light of course, and the visual texture of ocean, of sand and sky. And I consciously try and incorporate this sense of movement and texture into my work. But there’s also the minutiae, from where I draw the strongest inspiration. Walking at Streedagh a few months back I looked down, as you do, to avoid the rain in my face and was gifted an isolated shape in the sand of a small shell. I picked it up as I have often done before, and that was the beginning of a new design process. There is an ebb and flow to designing. I take care to listen along the way to little clues the making and materials present me with. In this case I hadn’t appreciated that as I had worked and reworked the design in the empty space at the centre of the shrill there is a heart shape. Researching the translation of shells core into Irish, gave me the Irish word Croi, which means both Heart and Core, a wonderful co-incidence with the last line of W B Yeats poem Lake Isle of Innisfree. With Sliogan as the Irish name for shell the new collection had named itself, Croi Sliogan. This is an encapsulation of my journey from local to global, a small shell on a beach becomes a design idea, a collection I get to sell all over Ireland, and through my website out into the world. Those of you I am friends with on social media may know Croi Sliogan got off to a lucky start in terms of its global presence when I was lucky enough to encounter her royal highness Sophie Countess of Wessex (married to Prince Edward) in Kilkenny Shop Dublin when I was launching the collection there a couple of weeks back. The Countess admired the collection and asked me in detail about its origin and inspiration. I asked her if it was OK for me to present her with a necklace from the collection, to which she replied ‘No, no, not unless I can buy the earrings to go with it’. We were delighted to see Countess Sophie out and about in Dublin that night and at Chateâu de Fountainebleau in Paris the next day wearing the full collection. The inspiration of a broken shell found on a north Sligo beach on a rainy winter’s day wound up in the international fashion spotlight. A local to global aspect of my business that I’ve become increasingly proud of, is our bespoke commissioning service. In the last 5 years this is something I never expected to have a global reach, however it is with increasing frequency now that we are making bespoke wedding and engagement rings for people all over the world. This began with a page on our website and then we started to receive email enquiries about getting an engagement ring made in a particular style or querying if an old piece of jewellery with sentimental value could be refashioned. I have to admit at the outset I didn’t take it very seriously. I didn’t quite believe that someone in Australia or Virginia browsing on the web would really be serious about having something so intimate and personal made at such a distance. I have been very pleasantly surprised. I have always said it is the most rewarding part of our work as jewellery makers to create pieces that represent the important milestones in people’s lives, whether they are our own off the shelf creations or a unique bespoke piece. Those pieces are deeply personal symbols, are part of a client’s life story for the rest of their lives, and often become the same for the generation that follows them. Until recently most of my commissions have come out of a conversation with couples visiting or from Sligo. Increasingly now, for us, this is an international internet related aspect of our work. Within the last 10 days alone we have had two couples from the US who not alone commissioned us to create their wedding rings but who have also made their holiday plans for Ireland and Sligo, so they could collect them. I’m the first to admit this aspect of our work will have little effect in growing our national economy, in bringing up Irish GDP. But for me and for my team it is a global accomplishment, one that is growing, and one we are extremely proud of. Our jewellery and a little bit of Sligo will be of significance to these couples throughout their lives. Wherever they are, as they speak with their children or their grandchildren, they will learn their family heirlooms have been handmade in Sligo and carry a Sligo makers hallmark. This is something that creates binding links with our county for generations to come and for me this is a very special kind of global export. And now a really ‘Local to Global’ cause, close to my heart! I would like to say a big Thank You to Maureen Quinn who gave of her time and expertise when it came to applying gold leaf to this piece. As Leonie and I worked on the Globe we saw the opportunity to make little Daisy silver Pendants in the same design as a fund raiser for GOAL’S project ‘What on Earth’. They are available for € 50 from The Cat & The Moon shop and from our website, with all proceeds going to GOAL. Thank you so much everyone for listening to me today. Again, I can’t tell you what an honour it is to represent women in business from this region for NWED 2018.